Definitely a very appealing, delightful and refreshing appetizer if you serve with a main course. But I made this as my dinner cos my big kids have their dinner appointments. 1) Combine the mango, cherries and cherry tomatoes in a bowl. Set aside. 2) Thaw the scallops. Rinse well and pat dry with few layers of kitchen towels. Do not cover, refrigerate the scallops for 30 minutes to dry. 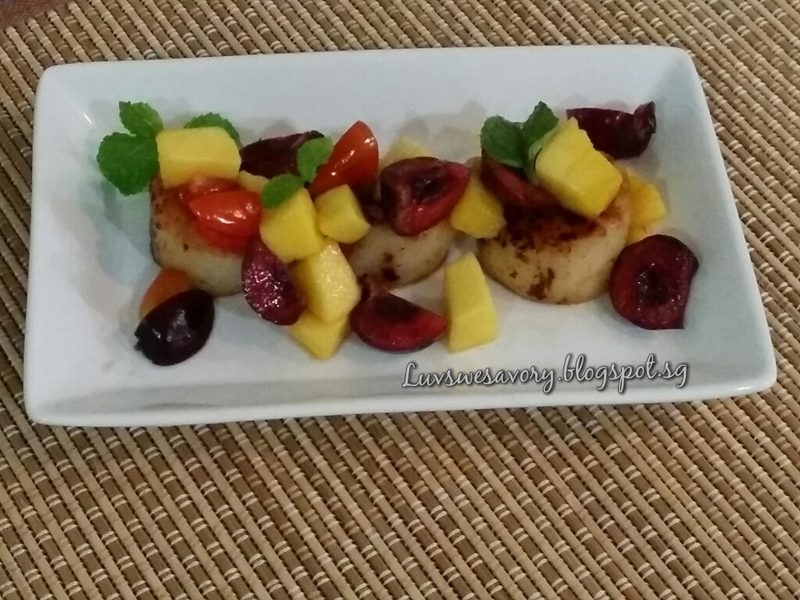 3) Season the scallops with dash of salt and pepper to taste. 4) Saute non-stick pan over medium-high heat. Add olive oil to the pan, followed by butter and vanilla extract. Then add in the scallops, set in a single layer in the pan. Cook 2 to 3 minutes, until bottom of each scallop is nicely browned. 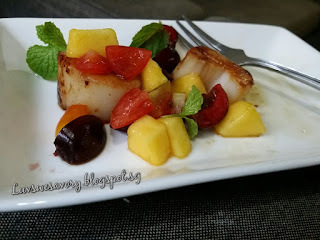 Turn scallops over and cook for another 2 to 3 minutes until they're firm, browned, and caramelized. 5) Arrange the cooked scallops on a platter and top with fruit mixture and drizzle the remaining butter from the pan. 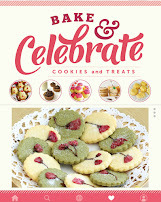 6) Sprinkle with a pinch of sea salt, garnish with mint leaves and serve immediately. 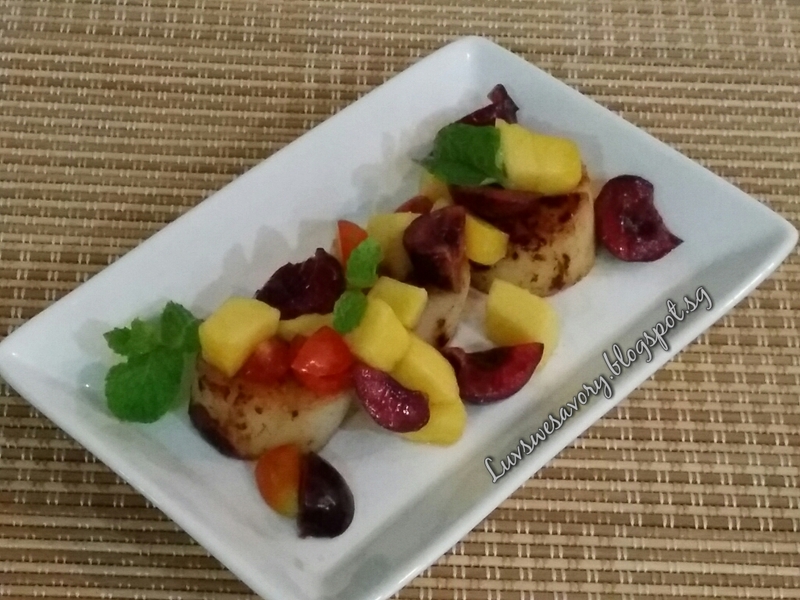 Tender scallops with a hint of vanilla fragrance paired with mouthful of fresh fruits! Yum ! This is definitely mouth watering! Thanks for sharing this lovely dinner with LTU! 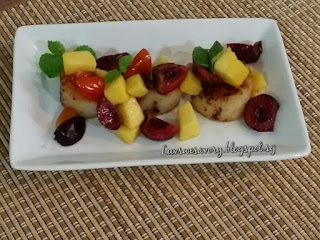 Scallop + Fruits! Yum Yum! Your big kids has leave mummy alone thus they miss this lovely dinner! 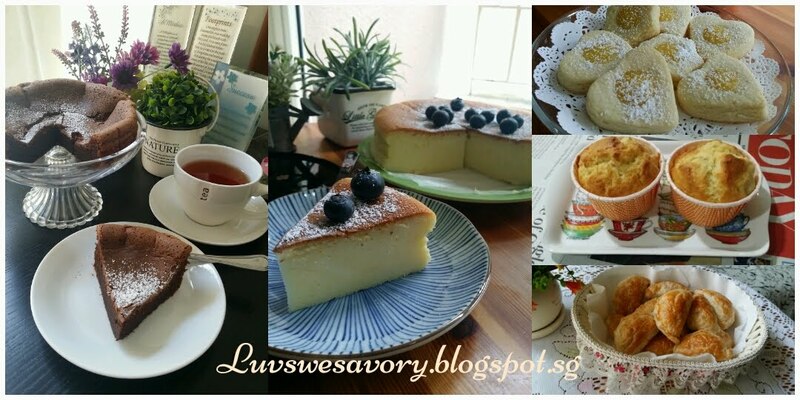 Hee .. hee... play some 'fine dining' ... go for quality instead if quantity ^-^! I think this may be the first time I've seen scallops matched with fruits. Interesting!